This year’s February 14th, Valentine’s Day, marked the official launch of #ILoveMyBrain, a campaign started by EBC with the goal of raising greater awareness of brain disorders – mental and neurological – as well as greater recognition of the need to look after our most valuable asset: our brain. 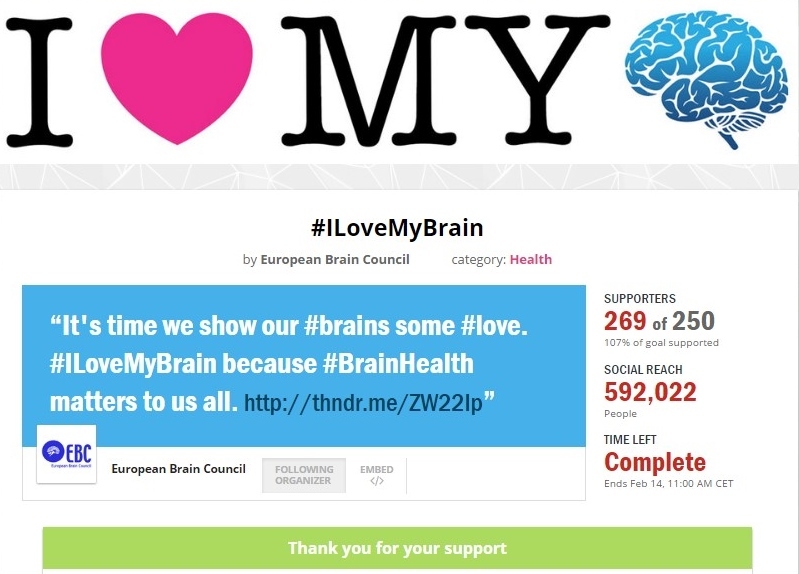 As part of our launch on Valentine’s Day, EBC created a Thunderclap campaign to help spread the message and #ILoveMyBrain logo even further. Thunderclap is a social media tool and the first-ever crowdspeaking platform that helps people be heard by saying something together. It allows a single message to be mass-shared, flash mob-style, so it rises above the noise of your social networks. The message EBC created was simple: “It’s time we show our brains some love. #ILoveMyBrain because brain health matters to all”. The message was scheduled to go out on Valentine’s Day, a day of love, the perfect day to remind us all to love and take care of our brain. It is with great pleasure that we announce the huge success of the Thunderclap campaign, which resulted in us achieving beyond our goal of 250 supporters, accumulating a total social outreach of 592,022 people across social media platforms, Twitter and Facebook. We would like to thank all of you who supported our Thunderclap and for helping us achieve this great success, which we hope to extend to future projects, campaigns and initiatives. We would also like to remind you that the #ILoveMyBrain initiative and logo are not ‘owned’ by EBC. We encourage you to use it to help promote any activity connected to brain health – social media campaigns, events, workshops and so on. To download the #ILoveMyBrain logo and read about the principles of use click here. From all of us at EBC, we wish you a happy Valentine’s & a brain-loving day.